The Smiths’ poster on the wall and The Beatles’ record on the counter are proof that walking into KWVS station is entering a place preserved by nostalgia. 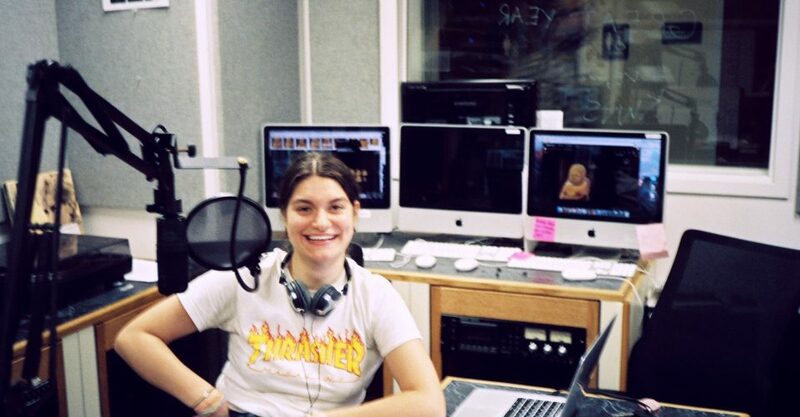 The student-run radio station has been on the air since 1963 and is aiming to gain more shows and dedicated listeners this year, according to the hosts. KWVS has received funding for new equipment, and, based on interest, have a projected 30 radio shows for this semester. A recording studio and updated equipment allow for bands to play and stream their music live. The show can be listened to through the live stream website, where archived shows can be found as well. Professor John Sitter is the faculty adviser for KWVS, the co-curricular program, and said he wants to allow the radio hosts to be as independent as possible. “I want them to have creative control and run the show themselves,” Sitter said. “I’m looking forward to just watching and seeing what they come up with.” It is because of this creative freedom that the hosts are able to push boundaries and explore various aspects of radio. “Show me the rules,” senior and host Paul DiRico said. This is the mantra the station has echoed for years. They strive to push boundaries and allow for creativity. DiRico is the director and has been one of the driving forces and hosts behind the station. He explained the inner workings of hosting a show for KWVS and emphasized why Pepperdine students and locals should be listening. KWVS listeners are exposed to talk shows, radio shows, podcasts and concert ticket giveaways throughout the various shows. DiRico said hosts are able to make the show entirely their own. Walking into the station is a freeing experience for the hosts and guests because of the versatility behind the microphones. Hosts can incorporate whatever they want into their show, which is determined by their weekly time slot. DiRico explained that there have been bands, both local and big names, as recent guests. DiRico and Craven explained that the hosts do their best to connect with people in the music industry and feature them on the show. Tickets are offered up to be given away while on air or at one of the monthly events which will be up on a calendar in the coming weeks. The next event is expected to be around Halloween, along with getting the station aired live in the HAWC. The hosts expressed that the station hopes to one day get their own radio frequency as well. One of the most anticipated advancements is a fully operable recording studio. Bands and individuals can now come to record their own music or play for the live stream station. DiRico said it was a way to bring people together and garner excitement for the station. “It’s important to be in a place that’s yours and can have music you relate to. 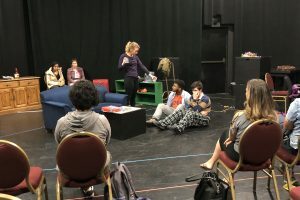 Hopefully, people can hear it and connect with it,” junior and host Maggie Wood said. There are new technologies and advancements coming to the station, but DiRico still sees the simplicity and quality behind the records on the counter. He discovered shelves of them on the back wall of a storage closet years ago and is committed to using them whenever possible. “I’m not just saying this but the records have a certain quality to them,” DiRico said. “It’s easy to stream them straight onto the air. You can hear the difference and the quality. It’s legit,” DiRico said. Connect with the station at radiopepperdine@gmail.com and listen to the live shows here.